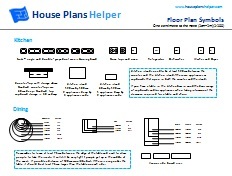 You'll need to get familiar with floor plan symbols if you're looking at floor plans. A floor plan is a picture of a level of a home sliced horizontally about 4ft from the ground and looking down from above. 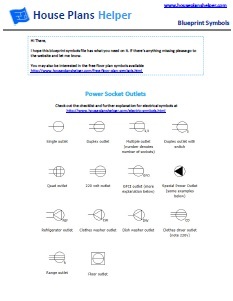 If you would like a set of free floor plan symbols (all of the symbols on this page drawn to scale and a set of blueprint symbols, go ahead and sign up below. Putting all these together and with a bit of intuition it's possible to work out most symbols but some are more difficult to figure out. I've explained lots of them on this page all arranged into sensible categories. The scale will tell you if you're floor plan is in feet and inches or the metric system. Here the feet and inches scale is on top and the metric underneath. The North arrow tells you about the orientation of the property. The top line represents an exterior wall and the bottom line an interior wall. Sometimes there may not be as much of a difference between exterior and interior walls. Walls can also be represented by a black outline rather than a solid line. 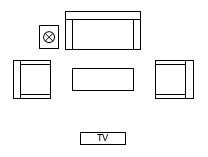 The dotted square top left indicates something above the line where the floor plan is cut (typically 4ft). This might be a dropped ceiling. The dotted line might be a ceiling beam. 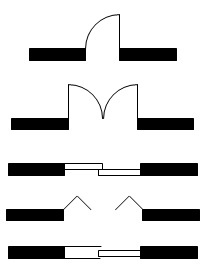 The solid circle and square represent columns. The black and white circle is used to indicate floor heights so you can tell if there's a step up or down. The image at the bottom represents a fireplace. 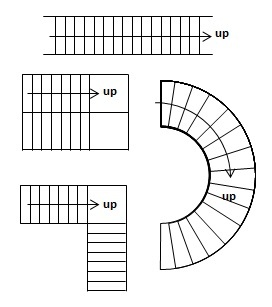 Here's some stair layouts. There's straight up, up and back on yourself and round a corner. Then there's sweeping staircase style. Top row from left ... sink, sink with draining board, dish washer. Bottom row from left.. oven, cook top, refrigerator. The solid line here represents the work top in the kitchen with the dotted line representing the cabinet above. Top row from left... bath, corner bath, shower. Bottom row from left... sink, double sink, toilet, bidet. Showers can often be different sizes than shown here but will always appear with a crossed lines through the center. Here's a little arrangement for you. The sofas and chairs are kind of obvious with the coffee table in the middle. The side table has a lamp on it and the TV is labelled. Dining tables - a round one for four and a rectangular one for six. These tables show chairs in the pushed in position so remember to look for clearance around the table so that people have room to come and go from the table. Here you have a queen size bed and a single bed nicely turned down! Below is a closet with built sides. The dotted line represents the rail.